Upon closer inspection, it was revealed to be a plant. And since it was growing out of the same spot where my Jack in the pulpit grew last year, I concluded that this is what the plants look like when they first shoot out of the ground. And though it looks a bit like a one-piece spearhead, if you look very closely you can see a little seam at the top where its pieces join together. 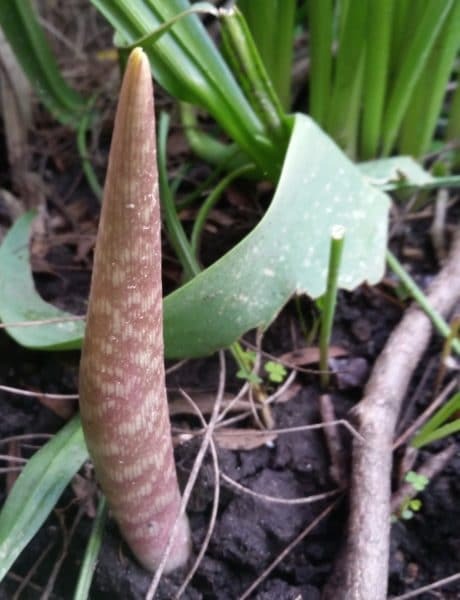 That tells me that this spear is actually the leaves of the plant folded tightly together around the stem, and will soon unfurl. It seems indiscreet to discuss its height, but I will say an upside-down carrot would be an appropriate comparison, as it’s about the size of a grocery store carrot. I like Jack in the pulpit because its flower is so strange and dramatic. It’s nice to learn that its sprout is strange and dramatic, too.